After reading many threads on this and other forums, regarding the correct workbench height, I have concluded that one size does not fit all. 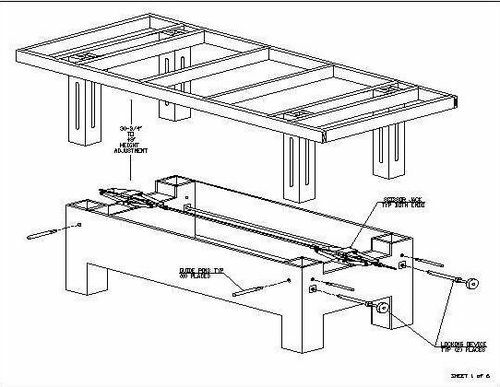 Bench height is dependent on the height of the person and the type of work being performed. Additionally there have been concerns from people with bad backs. It is therefore my opinion that everyone can profit from a bench with an adjustable height feature. This is not an easy one day to come up with an adjustable bench project. A bench that is fixed in height can be a very simple project that can be completed in a day with a small outlay of cash and materials, but a bench with height adjustment features will require a lot more thought. The simplest height adjustment is to make each leg adjustable in length, pinned with bolts and nuts. Although this may be the simplest way, it requires much physical effort to accomplish; fine if the adjustment is of a semi-permanent nature, but impractical if height adjustment is required frequently. An adjustable height bench will require some mechanical means to elevate and securely lock the top at the required position. There have been hydraulic and pneumatic means of doing this, but are beyond the ability of the average woodworker and his wallet. I have come up with my own design, which I feel will satisfy the needs of most woodworkers and won’t break the bank. • All height and locking controls are located at one side and easily operated without kneeling or squatting which is good for people with bad backs. • The legs are securely locked in position for a sturdy bench. • The elevating mechanism uses two scissor jacks operating in tandem and driven by a cordless drill. A hand crank could be fitted if desired. • The bench can be rolled around on built-in casters which retract automatically once the top is elevated. • A torsion box or solid surface top can be used (not shown in the sketch). • This particular bench measures 42” x 96”, but dimensions can be changed to suit your personal requirements. I look forward to your progress on your table. I think you have a great idea and will be following along. Looks great. It would be cool if you add some storage on each long side backing up to the jack rod. You can’t ever have enough storage. -- Still looking for ideas and advice. Interesting concept. I second the addition of storage. Thank you all for the encouragement. Back problems are presently curtailing my shop time, but hope to be back at soon. In the meantime, I’m spending my time at the computer refining my design. I purchased the plans but have not gotten around to making it yet. I’m familar with the Jack bench, although it wasn’t used as the basis for my design. I think it’s pretty expensive to build. My design is for a “basic” bench. There are so many variations possible, that I cannot cover them all. I thought about storage, but it would mean a major re-design. I would rather concentrate on the basic design and leave the type of top and storage up to the individual. Just for discussion purposes, I thought about different ways to elevate the top. 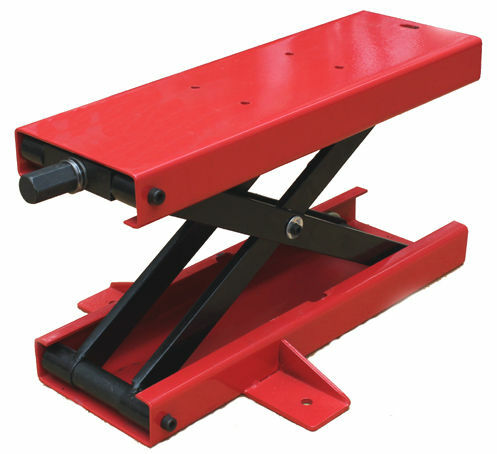 I thought about using a transmission jack, but for a long bench, I think there would be a binding problem, as the jack would be located at the center of the bench. If there was much weight on one end of the bench, it might not raise evenly and bind. For a short bench, say around 5’ long, I would consider using that type of jack. Another was to use two trailer jacks, located where the scissor jacks are. I found I could get 10” of lift with a 1000# jack and 15” with a 1500# jack, but the bigger jack would limit the lowest bench height. Another reason for not going with trailer jacks was they are made with a swivel mechanism for use when trailering and has a wheel on the end. That means I would have to cut the mechanism and wheel off and weld on a plate for mounting. That wouldn’t be a problem for some, but it would involve welding and some metal work. The type of casters are another area I explored. They need to be a swivel type, no locking device and be able to rotate within a 5” square. That limits me to a 2” to 2-1/2” caster. Any larger, and it won’t clear the sides of the column. The casters I plan to use are 2” diameter with a 150# capacity each. I hope this gives you some idea what to expect. Keep watching. time, so it will be a while before it is finished. I like the way you think!! Adjustable height work benches are great. And, your emphasis on making sure it is easy to use is certainly the right approach. I m familar with the Jack bench, although it wasn’t used as the basis for my design. I think it s pretty expensive to build. Actually, the Jack Bench doesn’t cost much more than a regular bench. From a cost/material perspective the only extra pieces are a few sheets of plywood, two scissors jacks, some hardware, and 4 casters. The biggest expense is from the vises. As far as jacks go, I tested several jacks when I designed my bench. RV leveling jacks are too big and they have very poor mechanical advantage. Most of the jacks on Amazon are too small. I did test a transmission jack, but the one I got was from Harbor Freight, it had poor mechanical advantage and the quality was terrible. I found that a regular scissors jack from a truck or full size van worked best for raising and lowering the bench top. One of the nice things about the automotive jacks is that they are relatively inexpensive. I first used a Honda Civic jack for the mobile base because the small jacks have so much mechanical advantage. Over time I discovered motorcycle lift jacks. You can see from the picture that these have a very large flat surface area. The bench is very stable and level when I raise it up with one of these. Motorcycle jacks typically cost anywhere from $60-$110, but they are well worth it!! Unfortunately, the motorcycle jacks don’t go high enough for the raising the bench top. Ron, I know it has been a while since you first posted this, but I would love to know how your bench turned out!